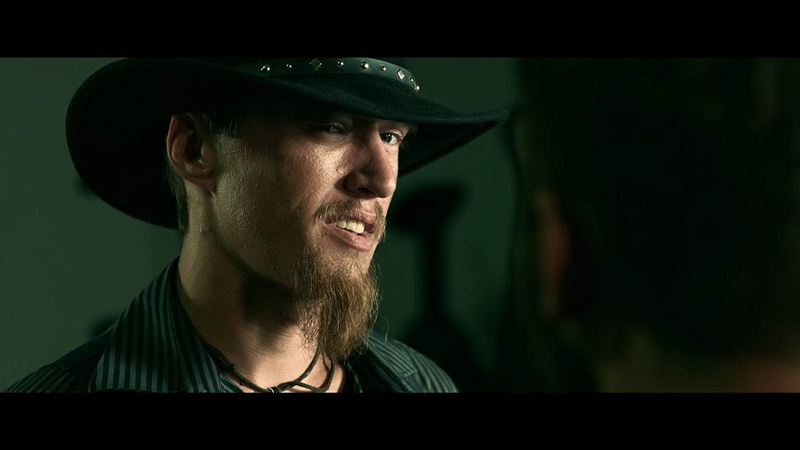 he Blood Hunter is an indie vampire film directed and written by Trevor Styles (Hobbes & Phil V.S Zombies), with Chas Llewellyn co-directing and writing. It follows in the footsteps of Near Dark, From Dusk Till Dawn, and John Carpenter's Vampires in that it takes place in the dusty backroads of America, and in Vampires case both feature vampire hunters. Former soldier Deckard (Tom Paxinos) lives a disastrous life, with a bitter ex-wife, a drinking problem, and money troubles. Things get worse one night when his home gets invaded by a gang of vampires. After inadvertently killing one of them, the leader - Caleb (Chas Llewellyn) swears bloody revenge on Deckard and plans to destroy him. Meanwhile Deckard has joined a local group of vampire hunters known as the Blood Hunters who set out to end Caleb and his gang. Being a low budget indie horror my expectations were not the highest when going into this. So it was with pleasant surprise that this exceeded my expectations, while also happening to be one of the most bloody vampire films I think I have ever seen! Near every action scene here ends with characters drenched with blood, whether it be their own, or someone else's. On several occasions vampires literally explode in a room filling crimson wave of blood and gore, it never fails to look fantastic with the sudden transformation of the set from normal to red nightmare. There is even one such occurrence where the blood is made to look like it has hit the camera and drips down it. The Blood Hunters weapons of choice are guns and these always look like they cause a lot of damage by the huge chunks of gore that fly out of their targets. On the vampire side of things their bites cause geysers of blood to spray out, and several heads get ripped off! While all this blood might not always look the most realistic the film makes up for it with the sheer amount of the stuff, something which impressed me from beginning to end. The cast for this were for the most part well chosen, particularly with the vampires. Llewellyn was captivating as the head vampire, while Gary Busby and Courtney Llewellyn were also memorable characters. I liked how even though these were evil creatures there was still humanity to them, at times you could almost identify with Caleb's misplaced anger at the loss of one of his own. 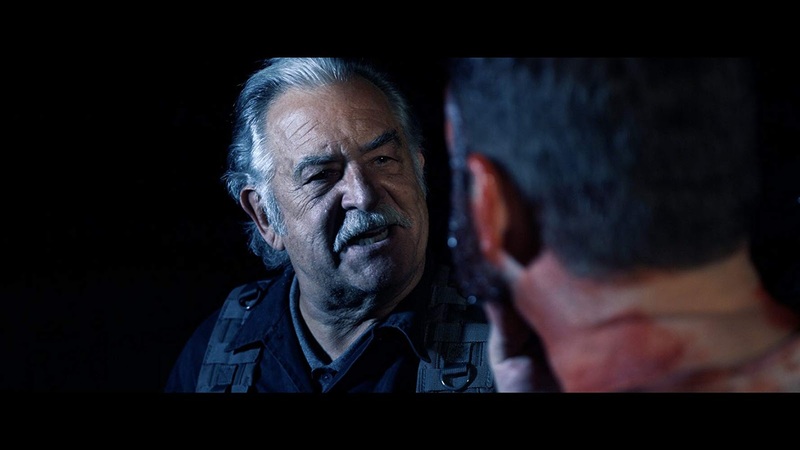 On the human side I thought Tim Quill (Dusk Till Dawn 2: Texas Blood Money, My Name Is Bruce) as leader Vince was another interesting character, as well as the under used Robert Bradley as the silent yet confident Poker. These characters all had some great scenes. However I didn't find the protagonist Deckard to be that good. He felt like a bit of a lame duck, and with the exception of Mack my least favourite 'good' guy. He never excels in any action scene he is in, constantly making bad decisions, annoying people, and does the weird film trope of not really seeming to be at all fussed when someone very near and dear to him dies, seemingly able to get over that in between scenes. I loved how low key the story here was, both the vampires and the hunters are shown to be flawed in the way they operate, it leads to a finale when neither side comes out looking great due to a mix of over confidence and apparent inexperience. These scenes still look great though, especially the finale, but a mid film fight in a barn was also fun to watch. The vampire effects are good, with red eyes and the traditional fangs. It was also interesting just how industrible the vampires could be, with the older the age of the creature the harder it is to kill, leading to one scene where one of them is repeatedly being staked through the heart as they slowly try to crawl away. The music in general is well chosen and adds a poignant feeling to some of the more tragic scenes. One part that plays out with classical music from a characters earphones being brought to the forefront reminded me so much of a similar scene from Rob Zombie's House of 1000 Corpses, I loved it. At times this story felt a little bit confusing, there were aspects that felt a little underdeveloped, while for some of the action parts it felt sometimes that characters were just stood around not really doing much. All in all though the directing and the cinematography led to some nice moments that low budget or not didn't fail to impress. It all adds on a fun cliffhanger that worked with the vibe of the movie. While The Blood Hunter can be very bleak at times there is also an element of fun worked into the script, such as the explanation for why one of the hunters is nicknamed 'fangbanger', Deckard's questioning of what a sub-vampire means, or the many one liners. I was overall impressed with this movie, occasionally I had issue with just how the story was told, but with the exception of undeserving hero Deckard this had a bunch of decent characters in the main roles at least. Also I have to again mention just how delightfully gory this is, it has been a while since I last saw someone get cut in half horizontally with a chainsaw! Check out the trailer for The Blood Hunter below.